What is it: A design study to celebrate 30 years of the M1 road and race programme. 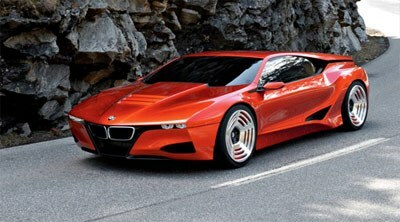 Highlights: Showcases a contemporary take on the M1and the mid-engine concept. Harks back to racing heritage for the BMW group with familiar aesthetics. Definitely worth a glance, sunnies requried to prevent eye damage from intense "Liquid-Orange" paint job. Australia-bound: Just for an intimate spell with the punters. Also-shows: Homage will parl alomgside the new twin-turbo 7 Series sedan as it makes its Australian debut. BMW's stunning M1 Hommage will be the centrepiece of the BMW stand at the 75th annual Melbourne Motor Show, which opens on 27 February at the Melbourne Exhibition Centre. The M1 Hommage show car will be the star of a dazzling two-stand display, alongside the all-new BMW 7 series sedan which makes its Australian debut at Melbourne. BMW is the biggest single exhibitor at this year's Show, which is the only Australian motor show for 2009. Other stand highlights include the just released BMW X6 xDrive50i plus the new frugal and powerful BMW 330d. The M1 Hommage was created to celebrate the 30th anniversary in 2008 of the BMW M1 road and race car program. It is a design study in the tradition of BMW Turbo - precursor of the original M1 mid-engined supercar - that represents a contemporary take on the M1 concept. The liquid orange paint work developed exclusively for the M1 Hommage evokes a classic BMW M1 colour, yet surprises with its powerful iridescent play of colour and brilliant depth. The M1 Hommage lifts many of the unique styling cues for the original M1 such as the air vents in the bonnet, louvres on the rear section and the black cut line that divides the roofline from the rear section of the body. Another feature carried over is the twin outboard BMW roundels, positioned at the extremity of each rear wing. Melbourne International Motor Show runs from 27 February to 9 March at the Melbourne Exhibition Centre, and is organised and promoted by the Victorian Automobile Chamber of Commerce through its dealer division the Australian Automobile Dealers Association (Vic).